If you select the tour with transportation option, meet your driver midmorning with pickup at your San Jose hotel, and travel roughly 50 minutes east of the capital to reach the rain forest adventure and ecotourism park. If you have your own transportation, make your way to the park at the designated time. 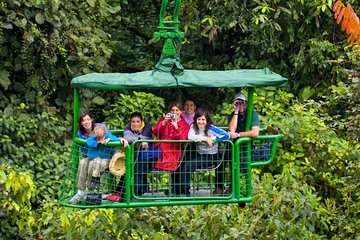 Take a seat on board a gondola car, and glide 1.6 miles (2.6 km) along suspended cables that stretch through various levels of the rain forest. The quiet, slow pace of the aerial tram allows you to appreciate the sights and sounds of this amazing ecosystem without disturbing it. Listen to the call of birds, monkeys, and insects, and keep a camera handy to snap photos of the verdant grove forest, hanging gardens, and canopy. At the end of the 90-minute tour, return to the forest floor. If you opted for the lunch inclusion, enjoy a meal of typical Costa Rican cuisine. Otherwise, return to San Jose either on your own or with a driver, depending on tour option selected. The tour was well organized and our guide was very personable, well informed and interesting. The arial tram ride was amazing.